Kit to lift the fork of your Triumph Twins by 30mm. 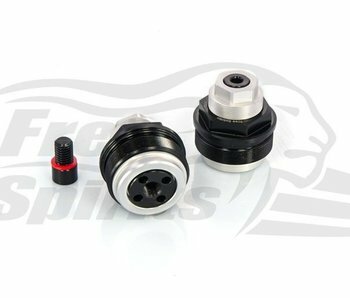 Not compatible for Thruxton 1200/R, Scrambler 1200 nor Speed Twin. Increase fork height and suspension travel by +30mm. In some cases you need to fit longer versions of brake hose and/or speedo cable (check on your bike if there is enough length to accommoate an extra 30mm. Designed and made in Italy by Free Spirits. Kit for an easy fork oil change: Motul oil, All Balls oil and dust seals, syringe/gauge. 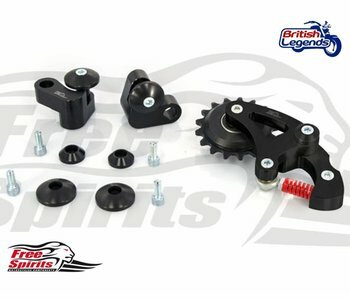 Kit with riser blocks and chain tensioner for Triumph Twin 900/1200cc. Lifts the rear of your bike by +36mm for a better look, a sharper behavior and an improved off-road capability. Kit to preload fork springs on all Triumph Twins, for improved suspension and a more precise road behaviour.